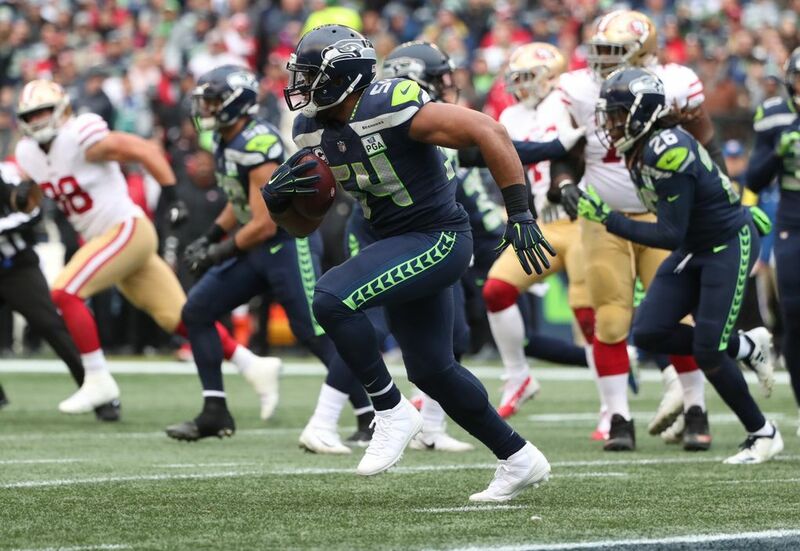 The Seahawks scored a season-high 43 points as they crushed their NFC West rival to stay firmly in the playoff race for an NFC wild card spot. 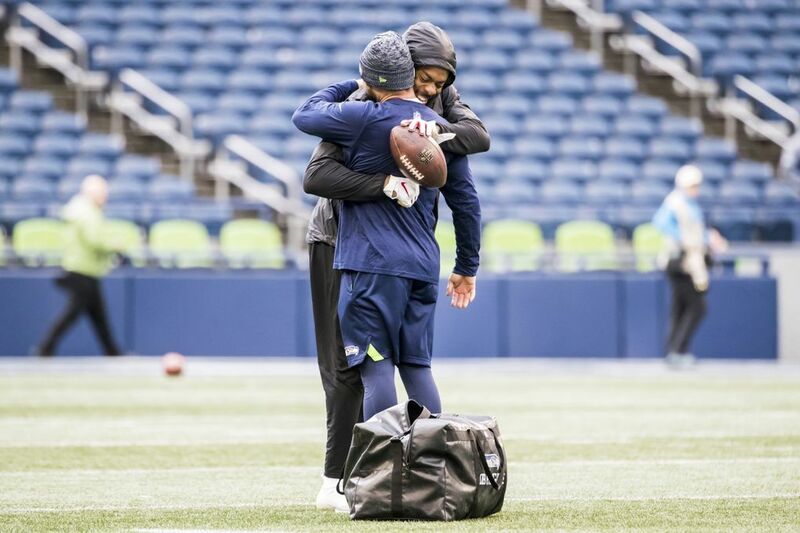 Richard Sherman was back in Seattle. 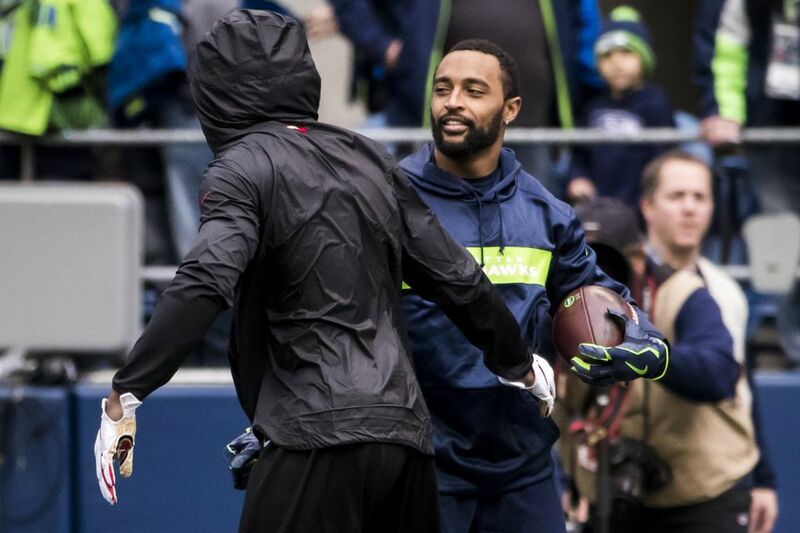 And so were the LOB-esque good times. 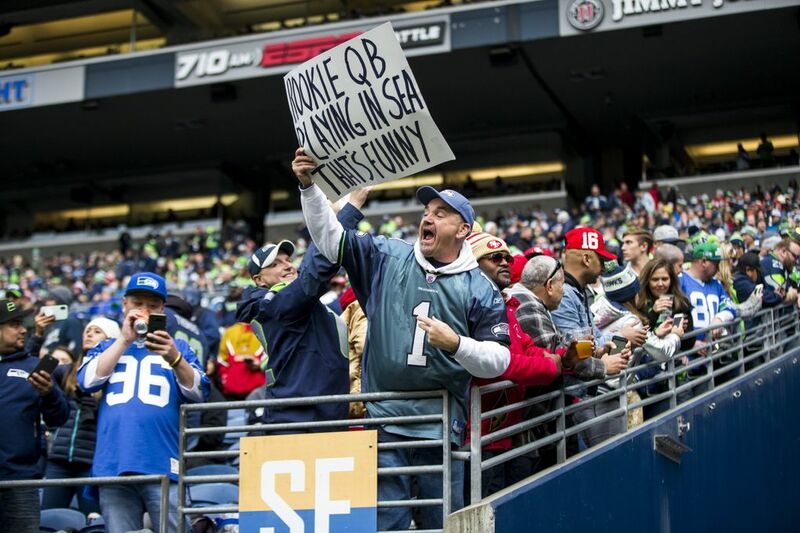 Not that the two were necessarily related. 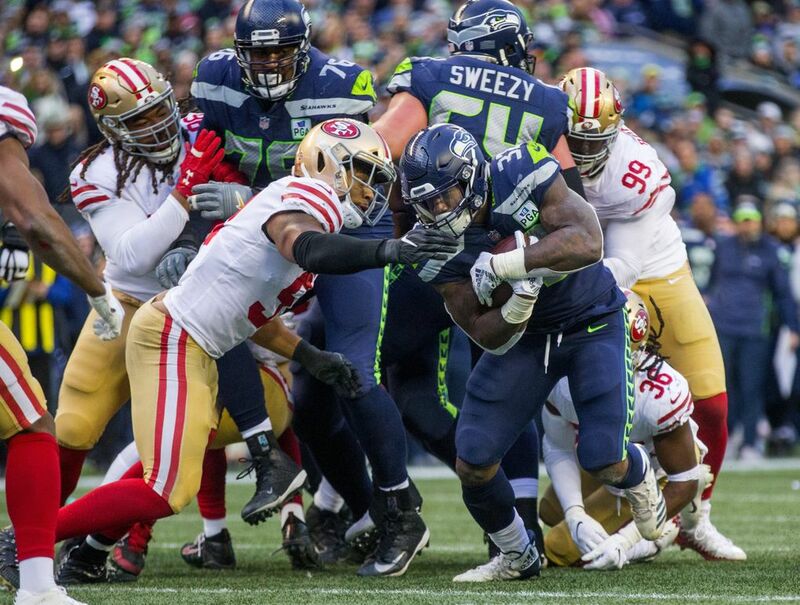 But with Sherman (and Super Bowl MVP Malcolm Smith) returning to CenturyLink Field, the Seahawks turned in a vintage performance, demolishing the 49ers 43-16 Sunday. 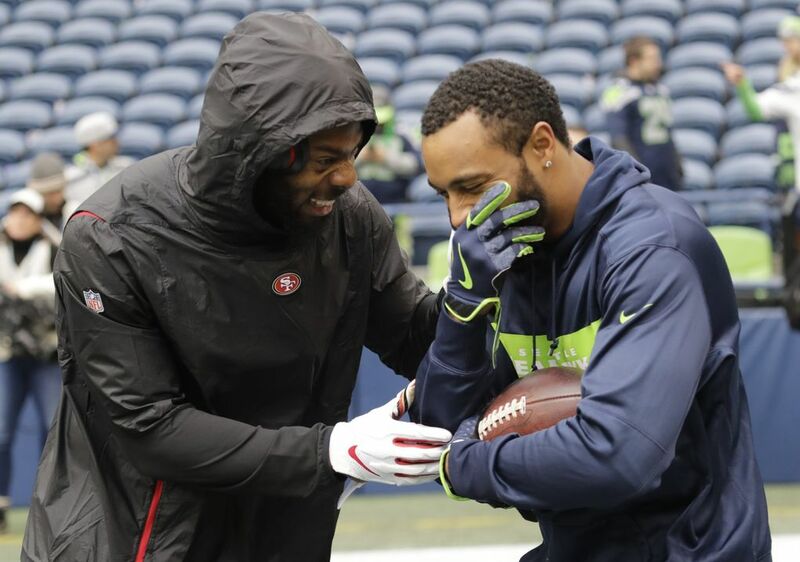 They did so with four touchdown passes from Russell Wilson — all punctuated by gleeful receiver celebrations, the first replicating Sherman’s famous tip that beat the 49ers in the 2013 NFC title game. 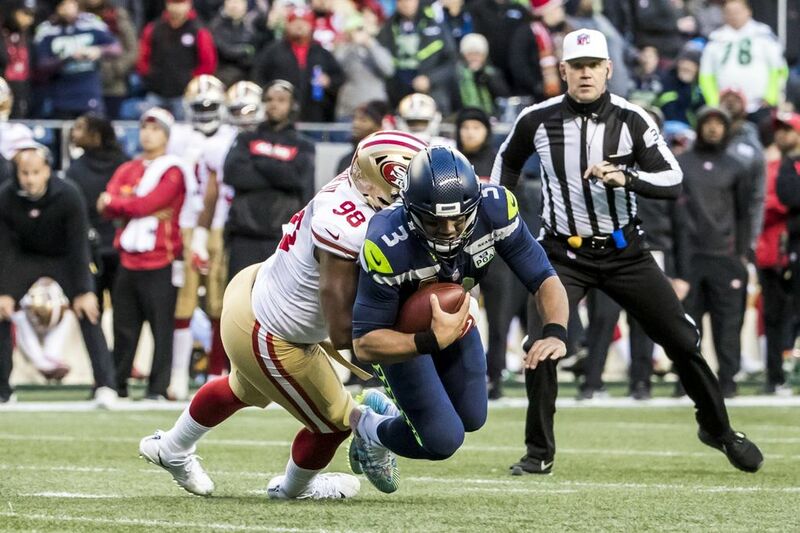 Wilson had only 17 pass attempts but he completed 11 of them for 185 yards. 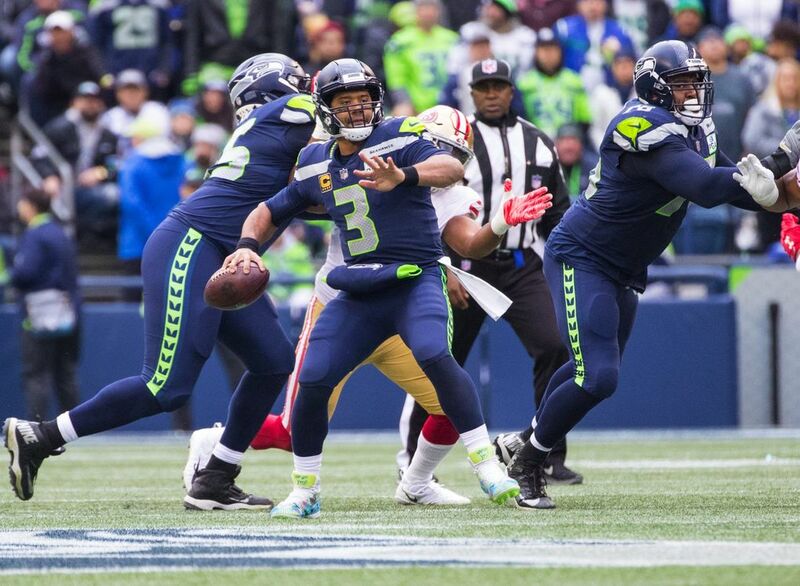 That included three touchdown passes on just six attempts in the first half. 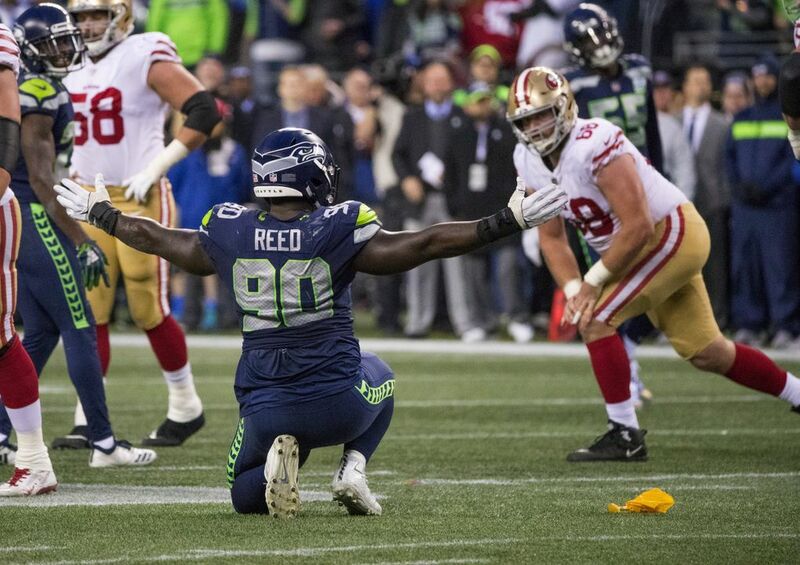 “That’s pretty rare,’’ said Seahawks coach Pete Carroll with a little awe. 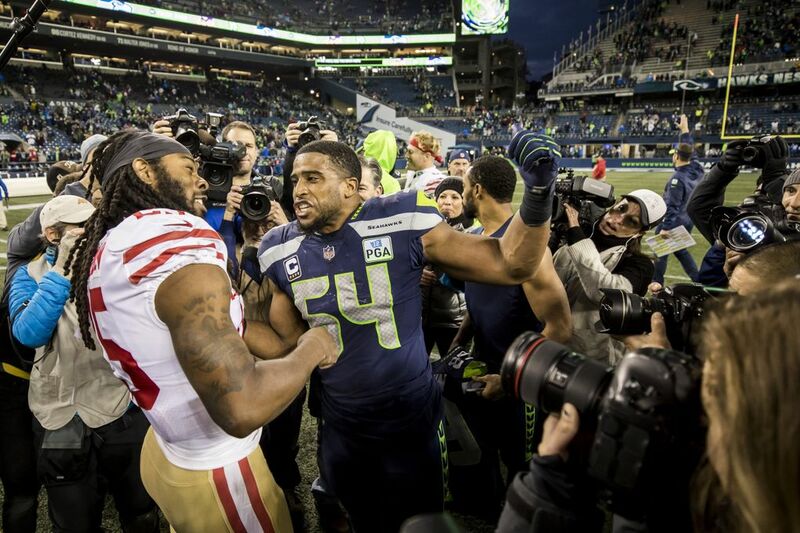 So was the otherworldly performance of linebacker Bobby Wagner, who capped one of the best defensive games in team history with a 98-yard interception return for a touchdown with 4:04 left, breaking the return record of 94 yards by Brandon Browner against the Giants in 2011. 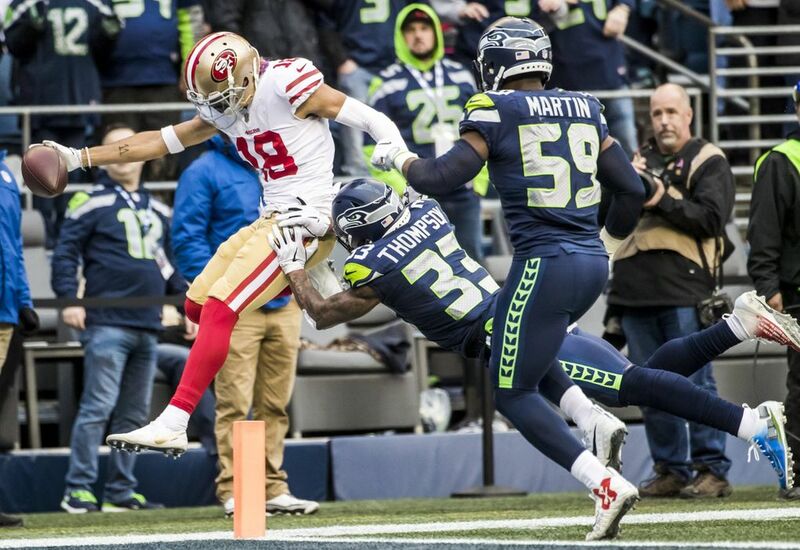 The interception came when 49ers quarterback Nick Mullens tried to hit Jeff Wilson Jr. over the middle at the goal line and Wagner stepped in front of the receiver and sprinted down the sideline in front of the 49ers’ bench, where Sherman had no choice but to sit and take it all in. 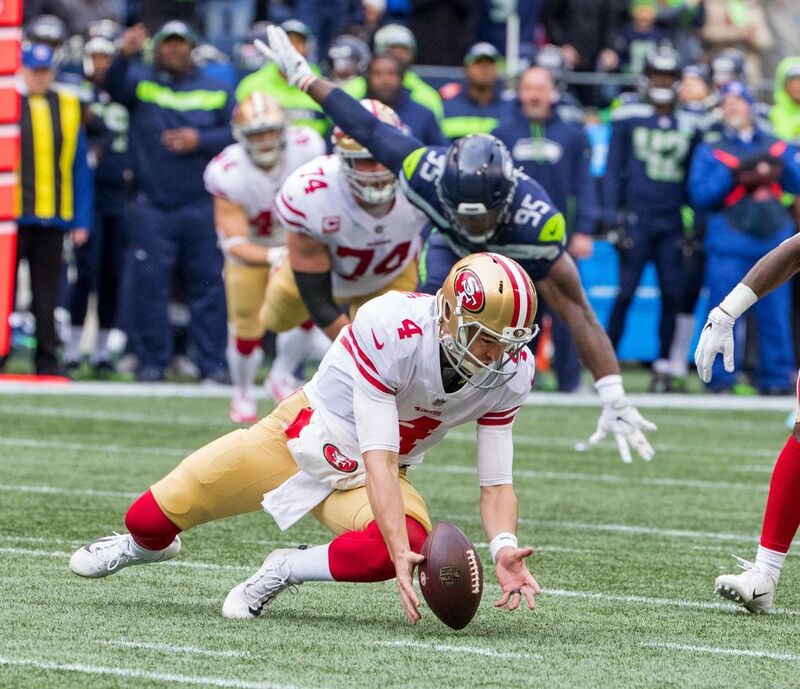 Mullens made a futile attempt to try to get to Wagner, but at about midfield it became clear Wagner was going to score. 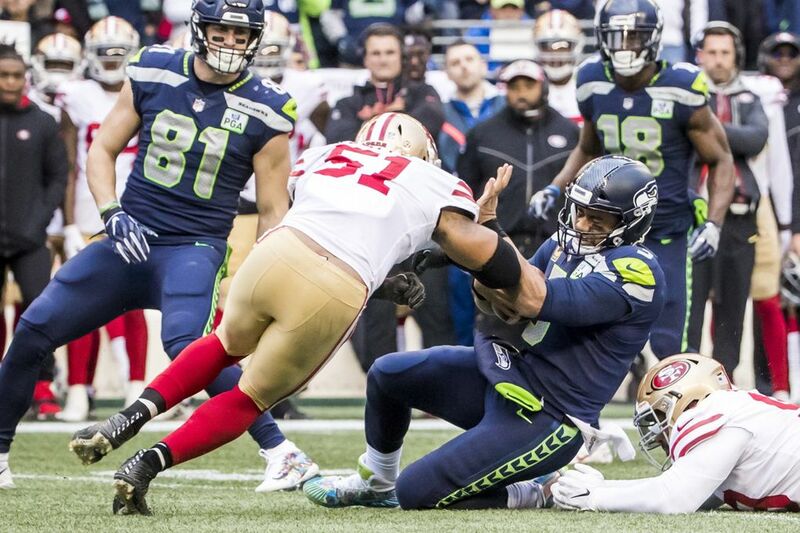 Once he got into the end zone, he pulled out the ball and used it as a pillow to feign going to sleep. 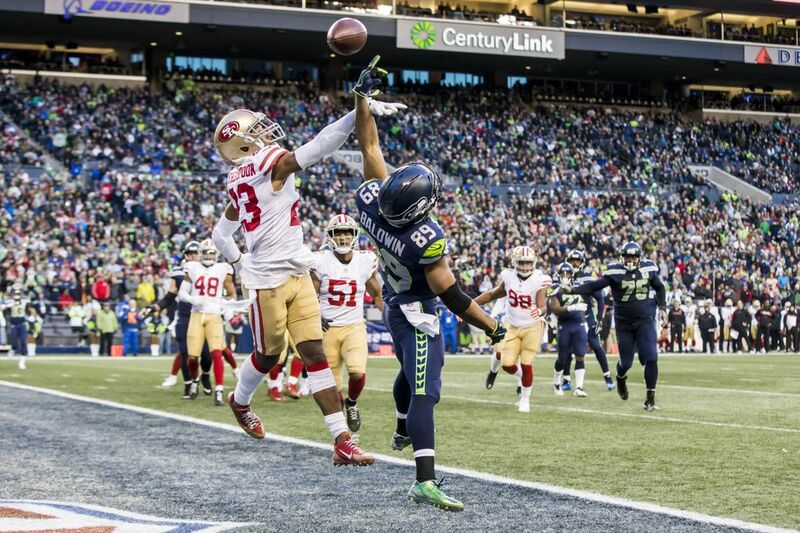 It could also have been viewed as a fitting metaphor for the Seahawks as a team that can no longer be slept on. 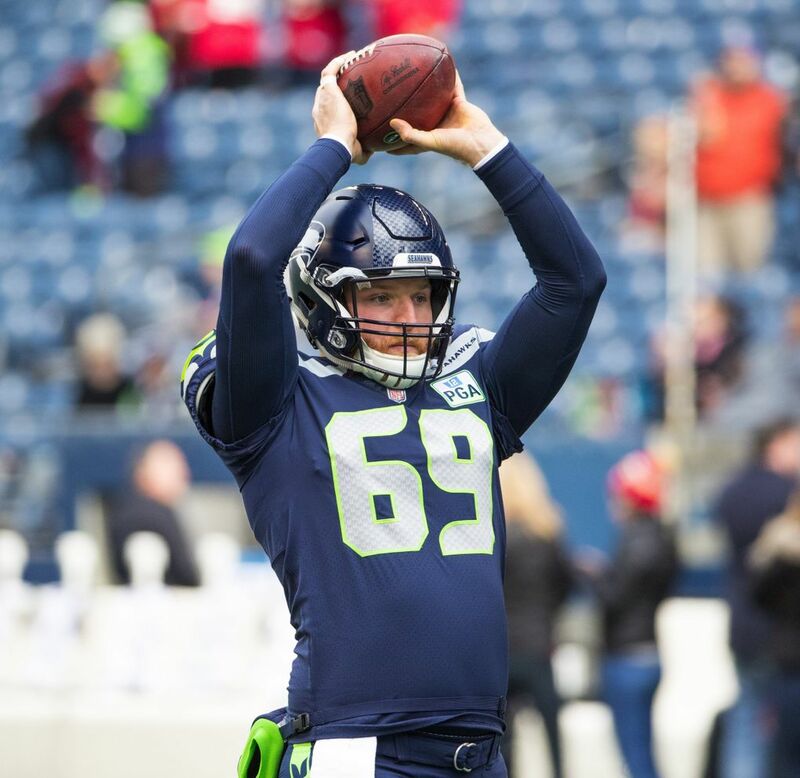 Seattle now is 7-5, a season-high two games over .500, and has won three in a row, five of seven and seven of 10 to move into prime playoff position after an 0-2 start. 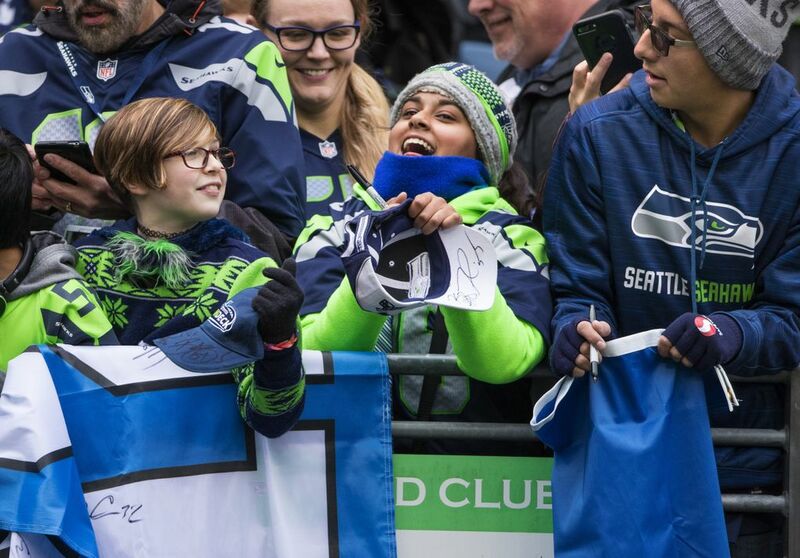 The victory, coupled with Minnesota’s defeat against New England, assured Seattle it will hold the fifth spot in the NFC playoff picture at the end of the weekend. 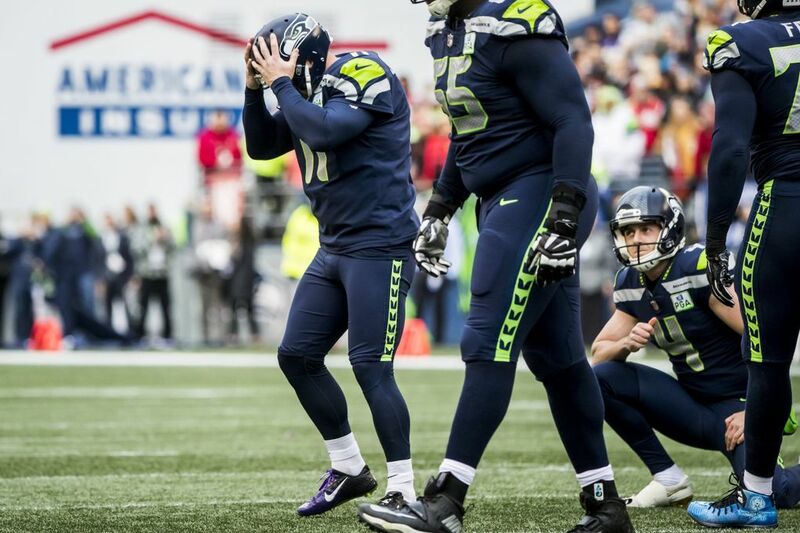 A few players, though, couldn’t help but concede they know things are going pretty well right now. 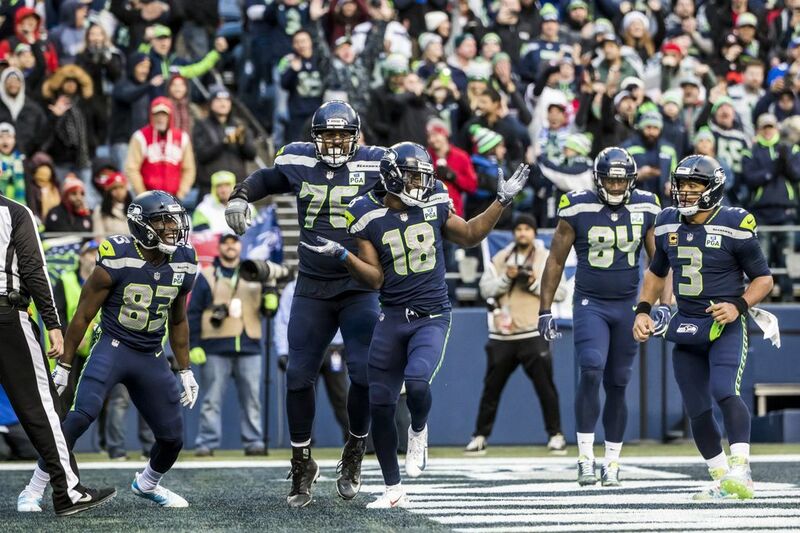 “For us to get this win at home, knowing that we’re continuously keeping our playoff hopes alive and that we’re in the driver’s seat is a good feeling to have going toward the postseason,’’ receiver Doug Baldwin said. 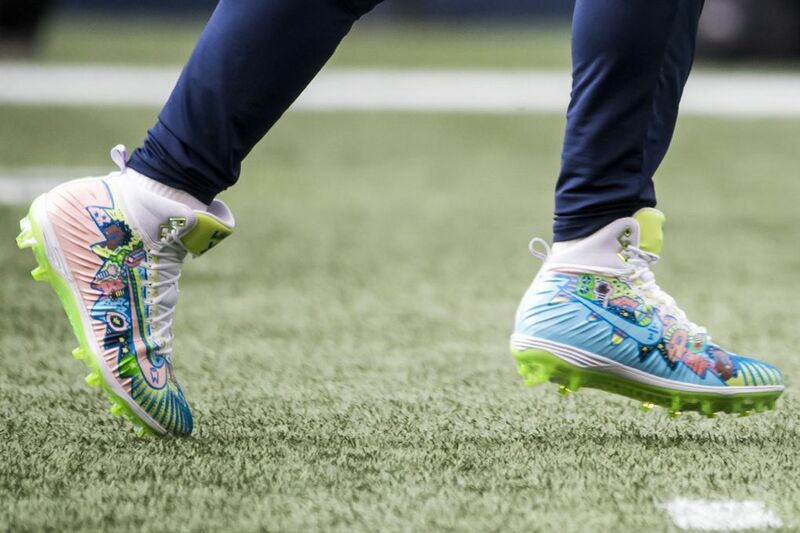 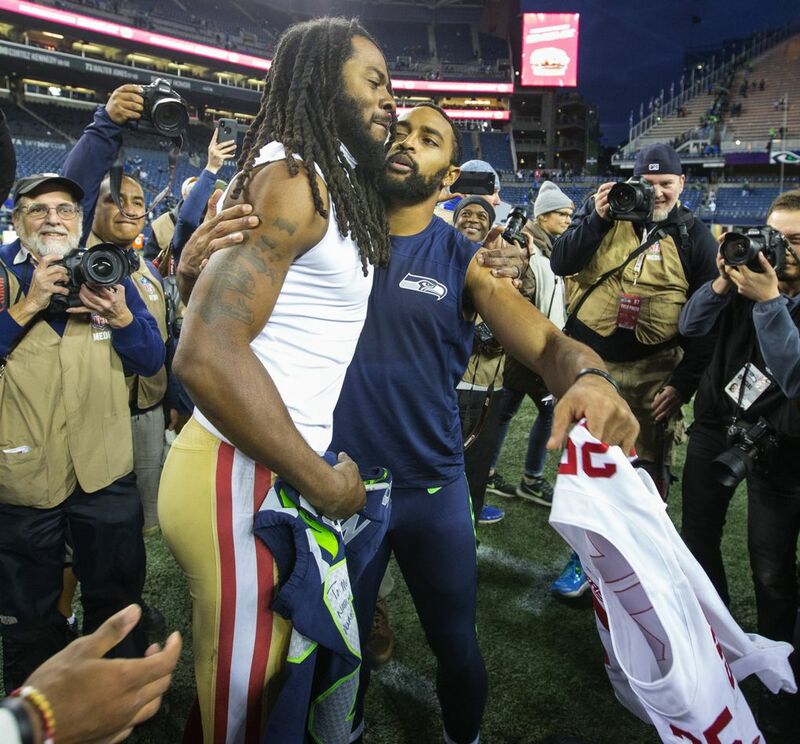 Much was made before the game of the return of Sherman, a member of the Seahawks from 2011-17 and a founding member of the famed Legion of Boom. 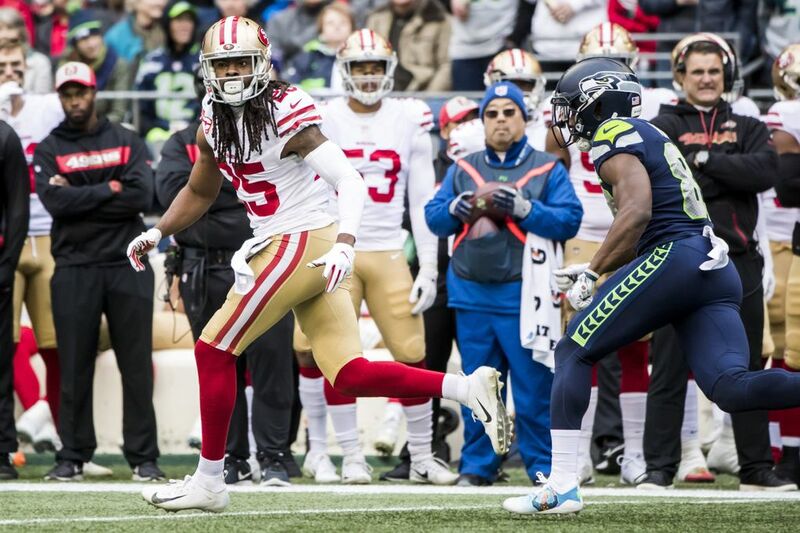 But Sherman wasn’t involved in much early on as none of Wilson’s six first-half passes went to his side of the field. 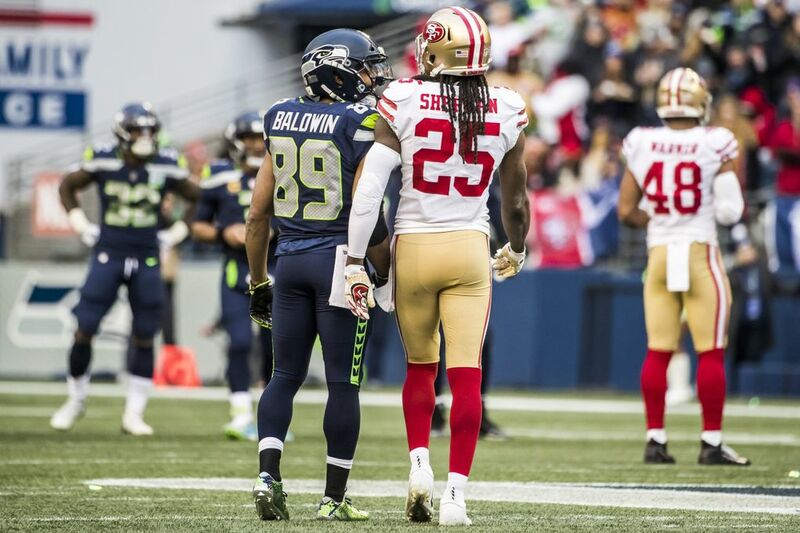 Sherman then was beaten for a short pass on a curl route to Baldwin in the third quarter with Baldwin breaking a tackle and going for 21 yards to convert a second-and-21. 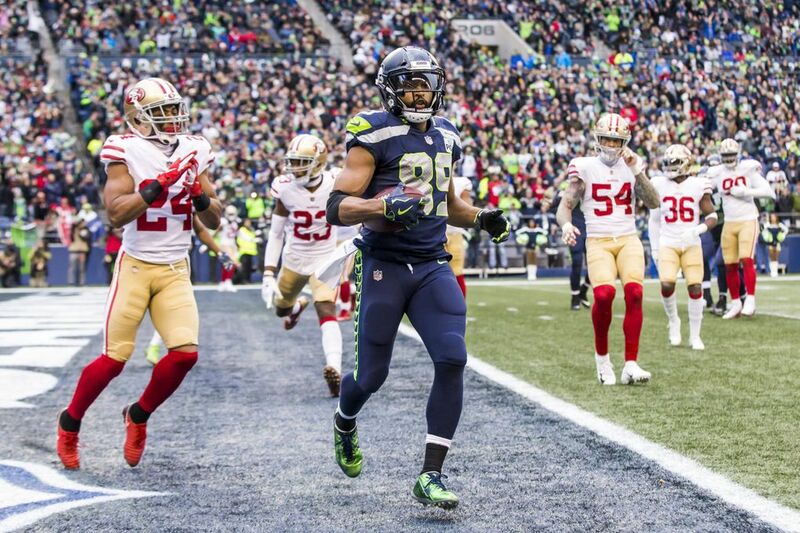 Later in the fourth quarter, Wilson’s fourth touchdown pass, an 18-yarder to Jaron Brown, came in zone coverage in front of Sherman. 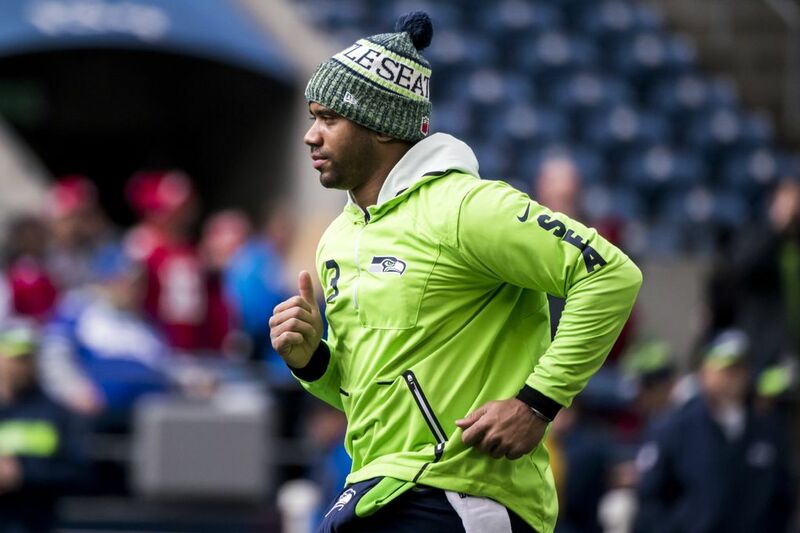 Otherwise, the return of one of Seattle’s most famous players felt like a minor subplot by the time the game was over. 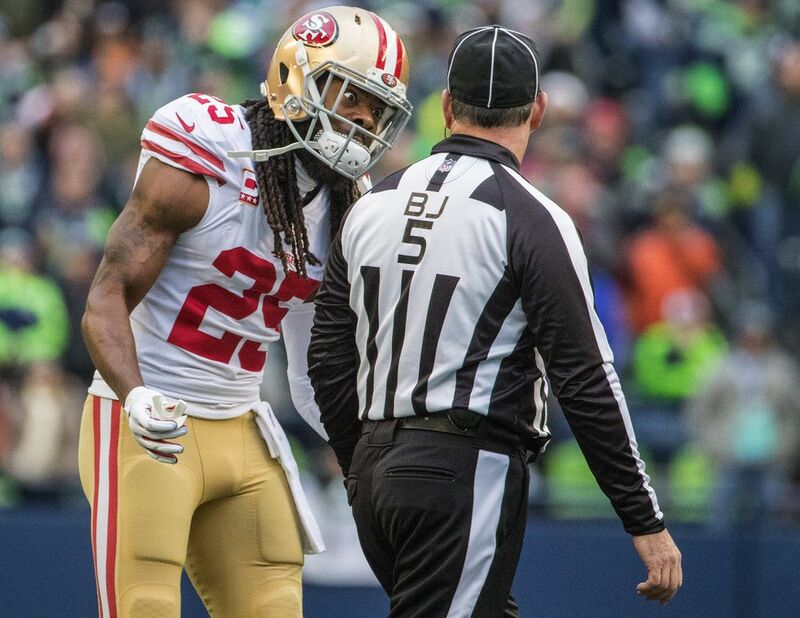 Sherman didn’t record an official stat of any kind. 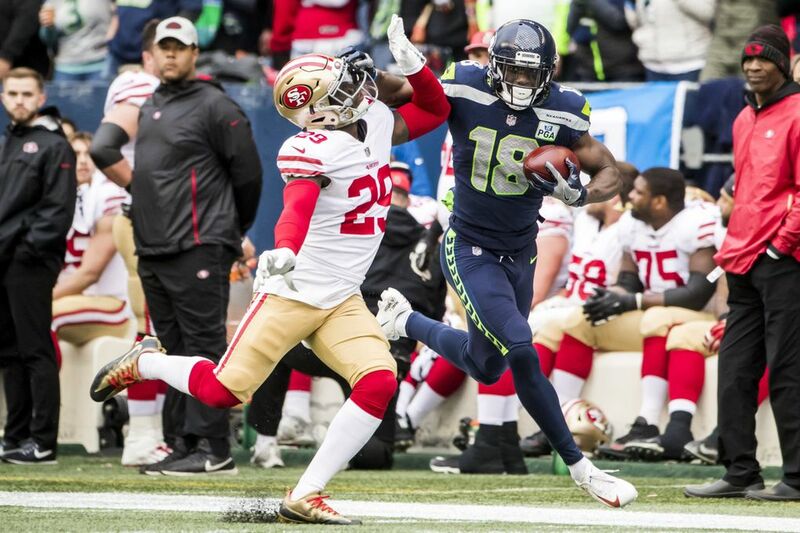 The Seahawks were favored by 10 points, the biggest point spread in their favor this season, and pretty quickly quashed any fears of a letdown or of overlooking the 49ers (though given the return of Sherman, that seemed a misplaced fear all along). 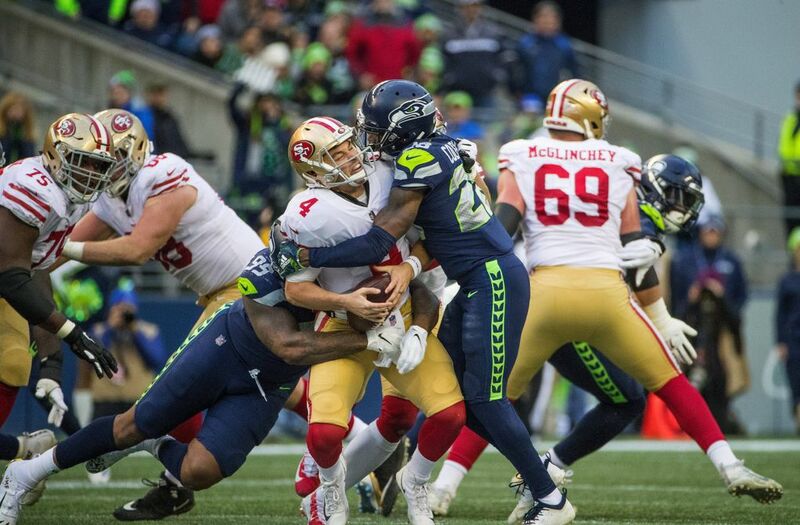 After going three-and-out on its first drive with three running plays against a 49ers team that loaded the box to stop the run, Seattle used the pass to score on its next two possessions and take a 13-0 lead. 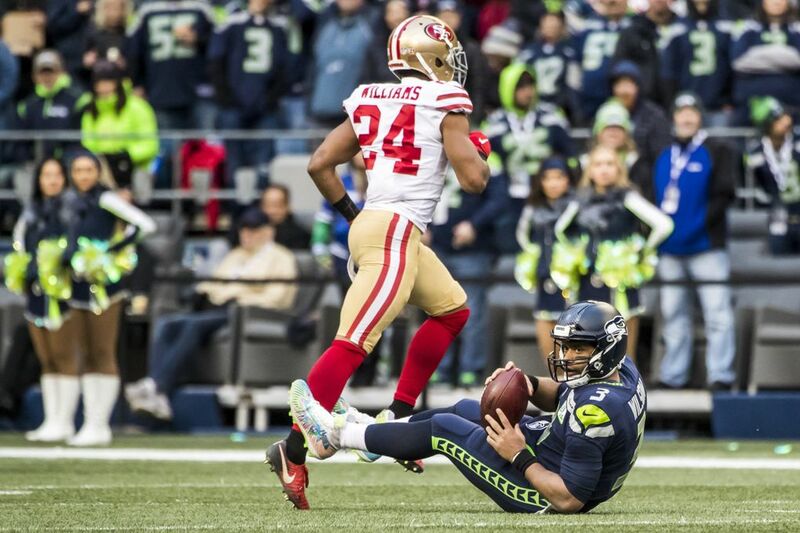 The first touchdown came on a 7-yard pass from Wilson to Brown that was set up by a Wilson’s 45-yard pass to Brown. 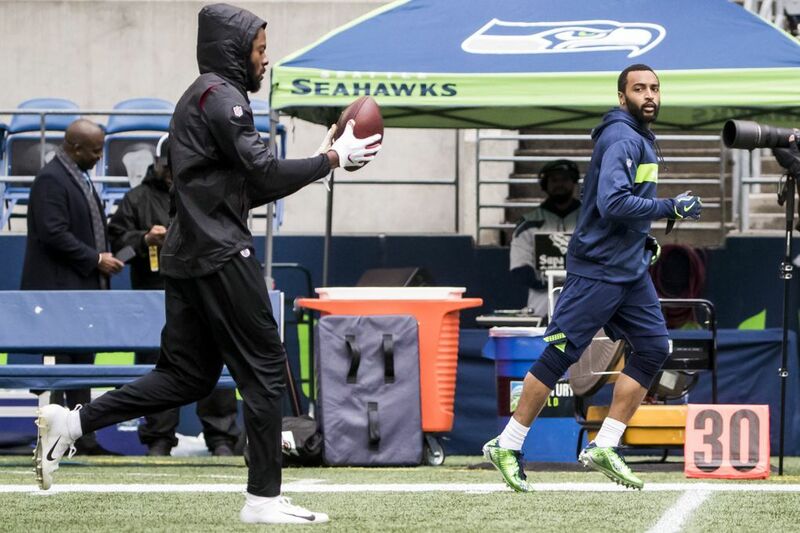 The Seahawks receivers celebrated with their re-creation of Sherman’s tip. 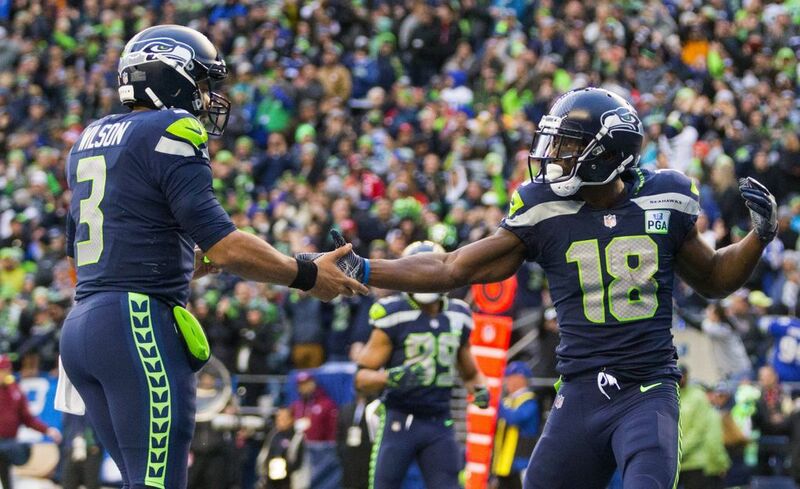 On the next possession, Wilson hit Lockett for a 52-yard touchdown. 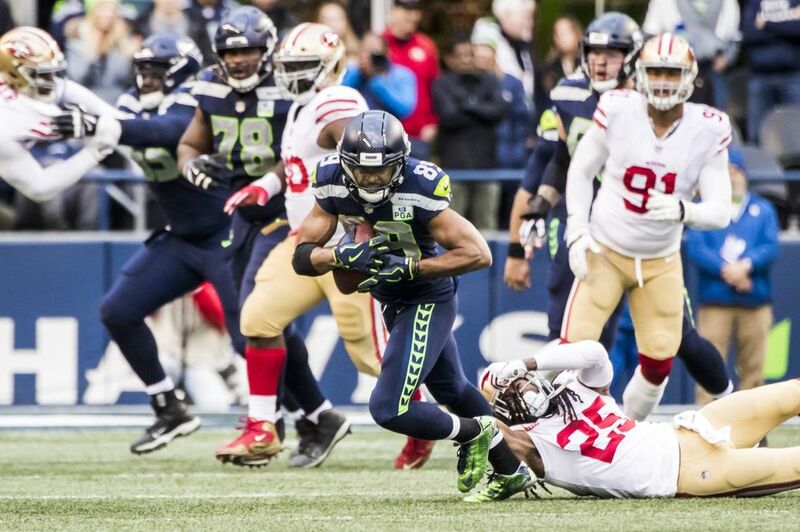 Lockett was in man coverage on the play with Smith, which Lockett later said was the “perfect’’ call against that defense. 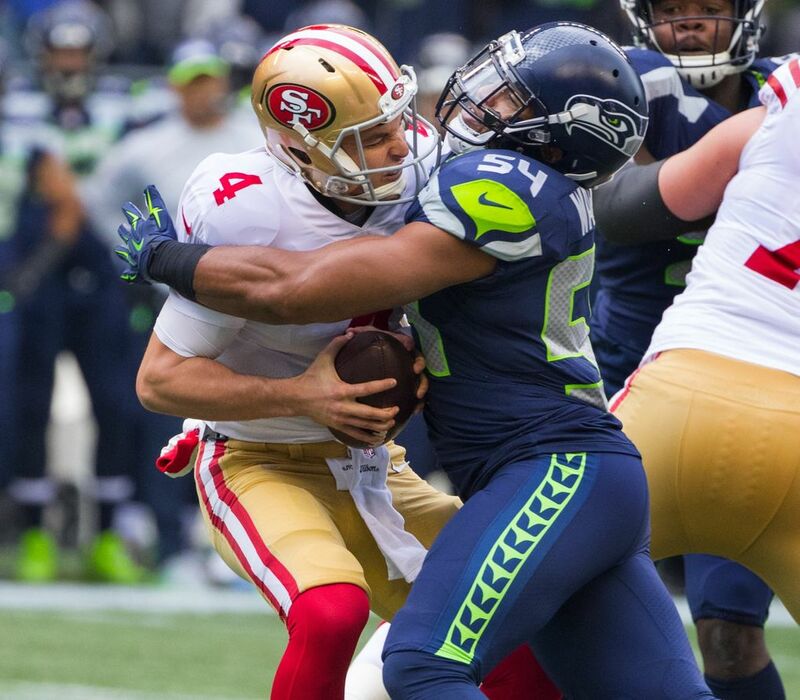 “I just kind of pumped it, stepped up, and then here goes Tyler behind the defense,’’ Wilson said. 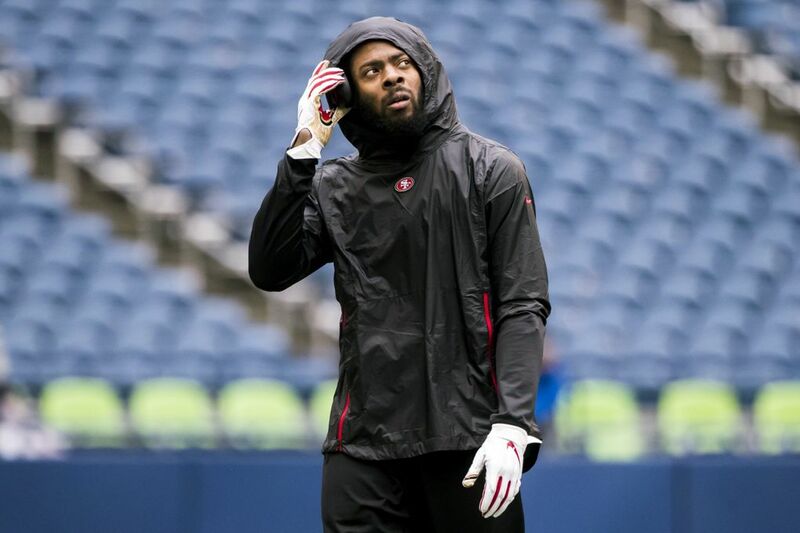 San Francisco responded with its one decent drive of the half. 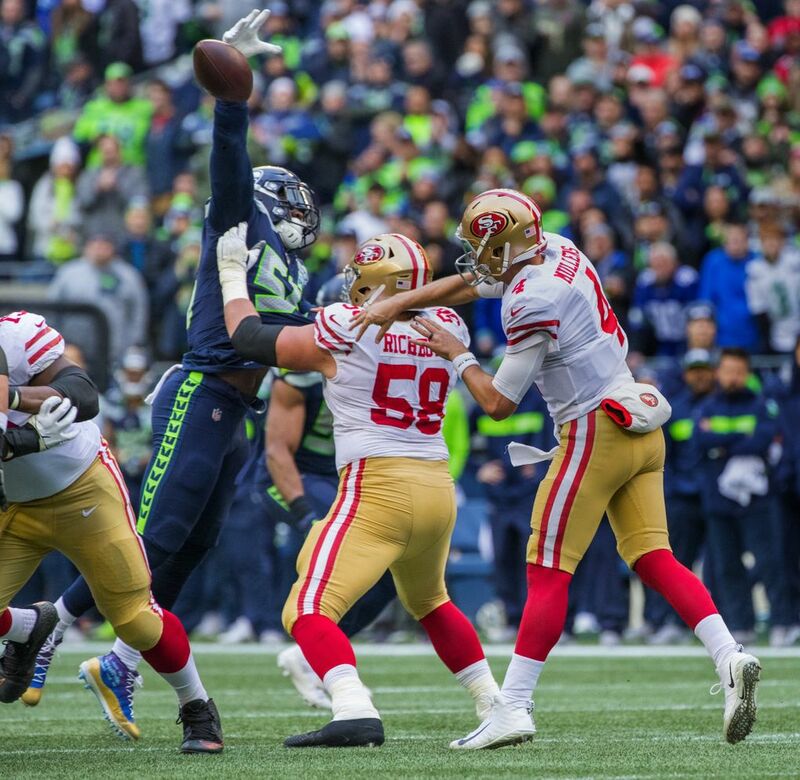 But Wagner, kicking off one of his most memorable performances as a Seahawk, then stole the ball from 49ers running back Wilson Jr. on a fourth down run to the 5-yard-line, returning it to the 14. 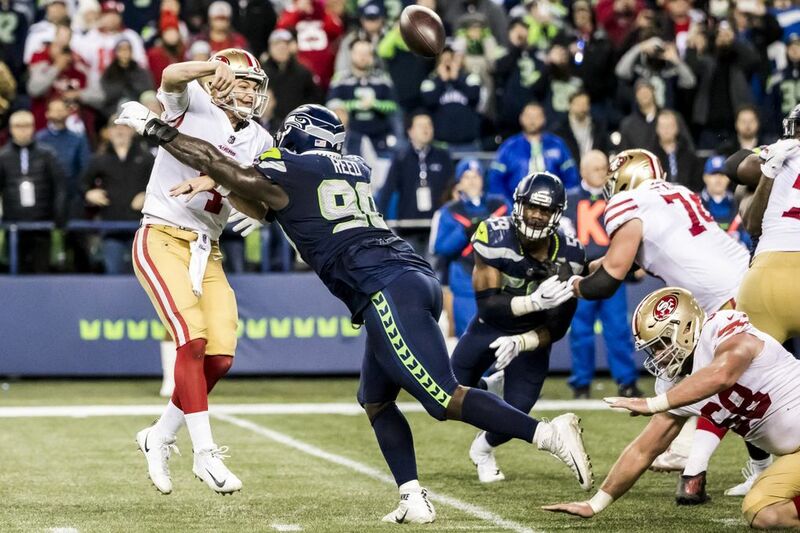 “He’s playing as good as you can play the game,’’ marveled Carroll of Wagner, who also had a sack on the 49ers first drive of the game and a team-high 12 tackles. 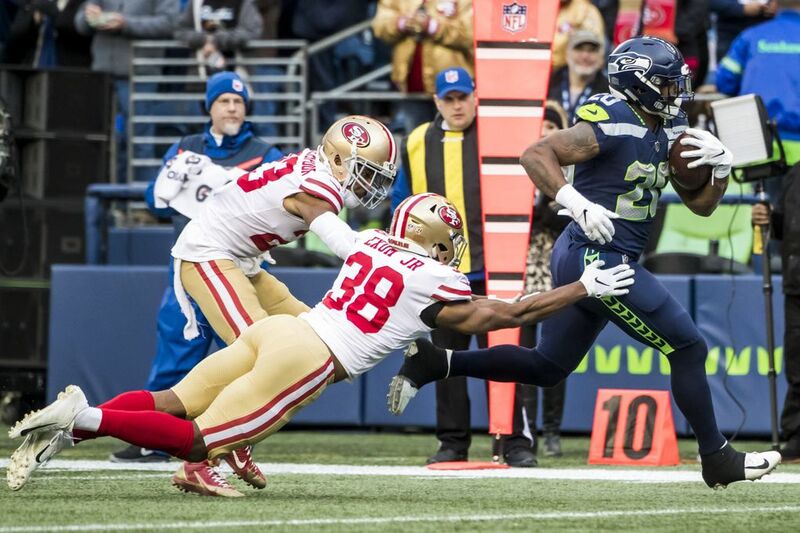 Later in the half, San Francisco’s Richie James Jr. fumbled a punt and Seattle’s Neiko Thorpe recovered at the 33. 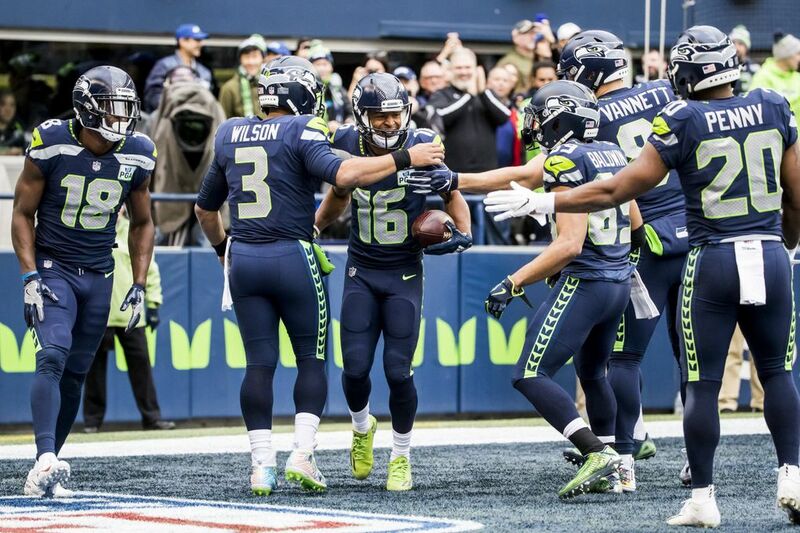 That led to a 1-yard Wilson-to-Baldwin pass five plays later and a 20-0 lead and yet another celebration by the receivers (this one from the movie “Life”). 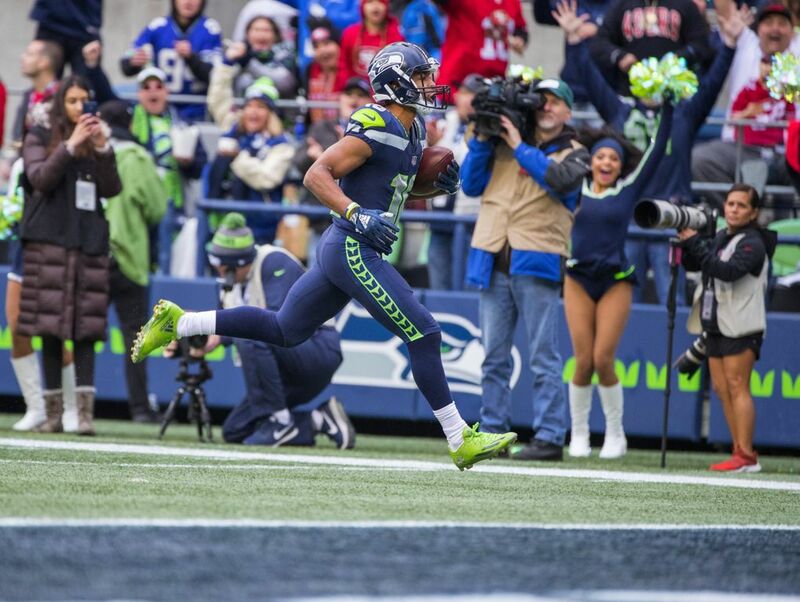 Lockett returned the opening kickoff of the second half 84 yards. 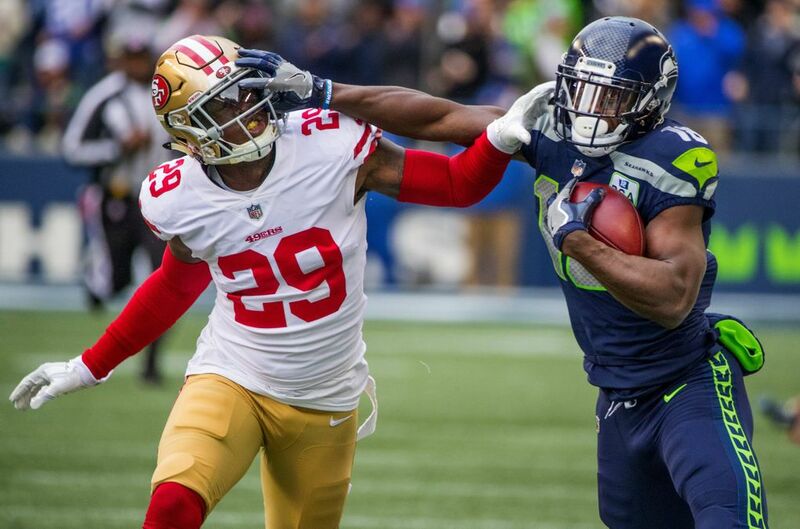 That set up Rashaad Penny’s 20-yard touchdown run on the next play, making it 27-3, and the rout was on. 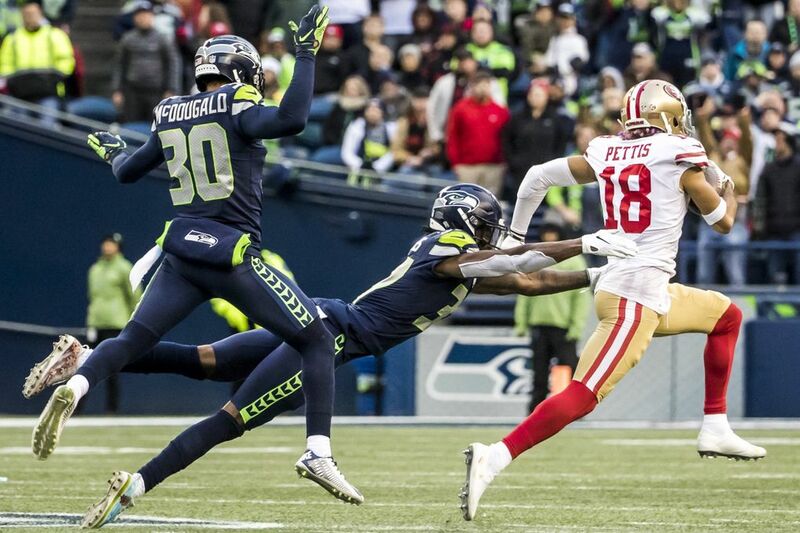 The rest of the game meandered a bit, with 49ers rookie Dante Pettis — a former University of Washington star — scoring two touchdowns in the second half, the latter on a 75-yard catch-and-run. 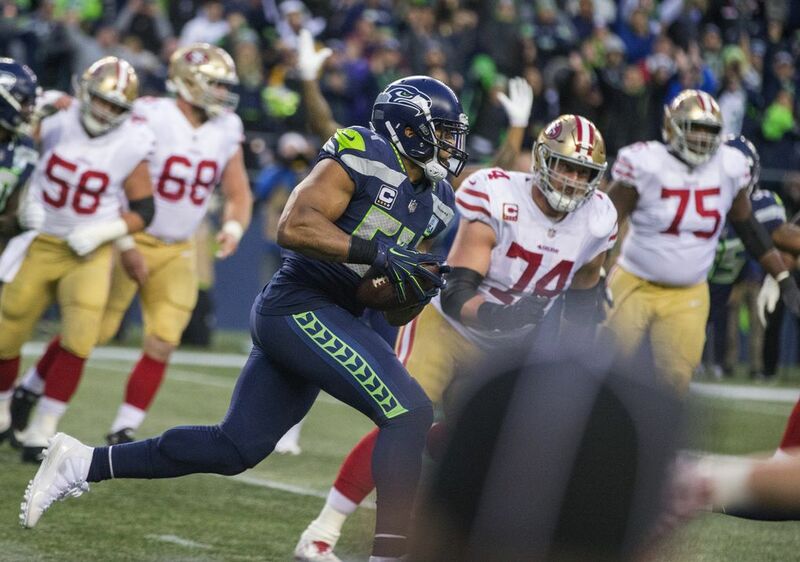 That’s the longest play allowed this year by the Seattle defense. 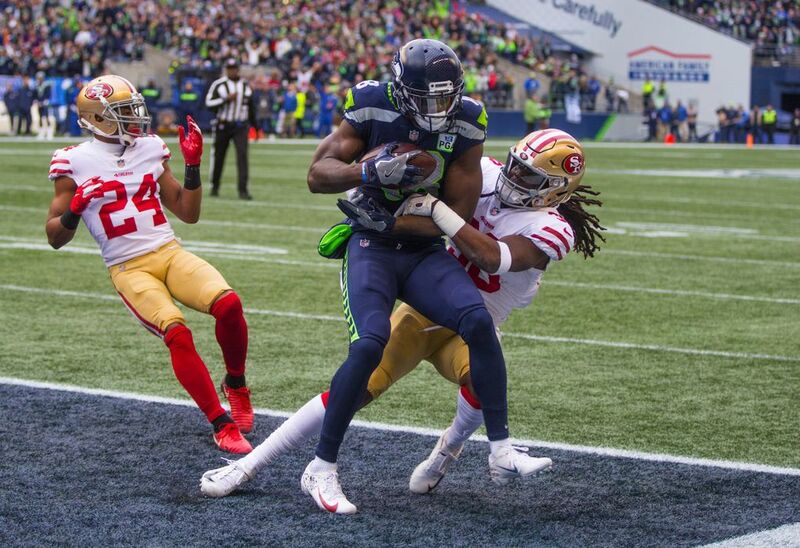 “It was just a big-play-o-rama,’’ Carroll said. 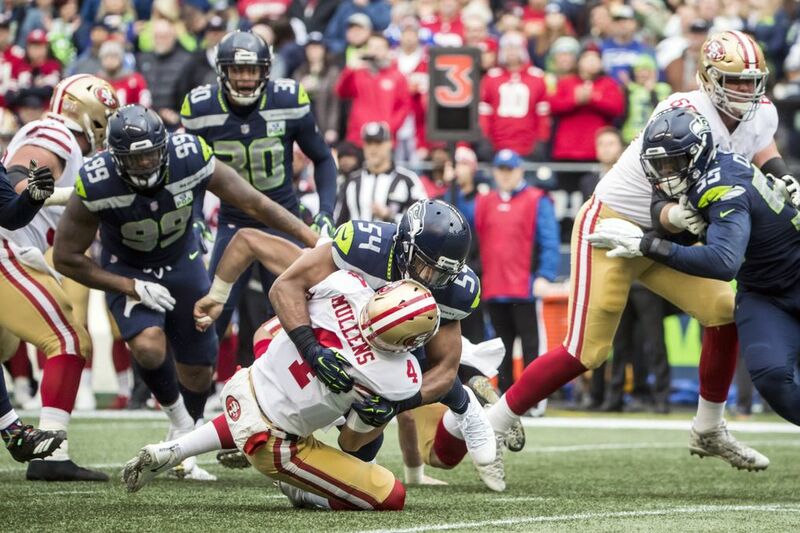 The 49ers were threatening to add another score when Wagner picked off Mullens’ pass and turned the game into an official laugher. 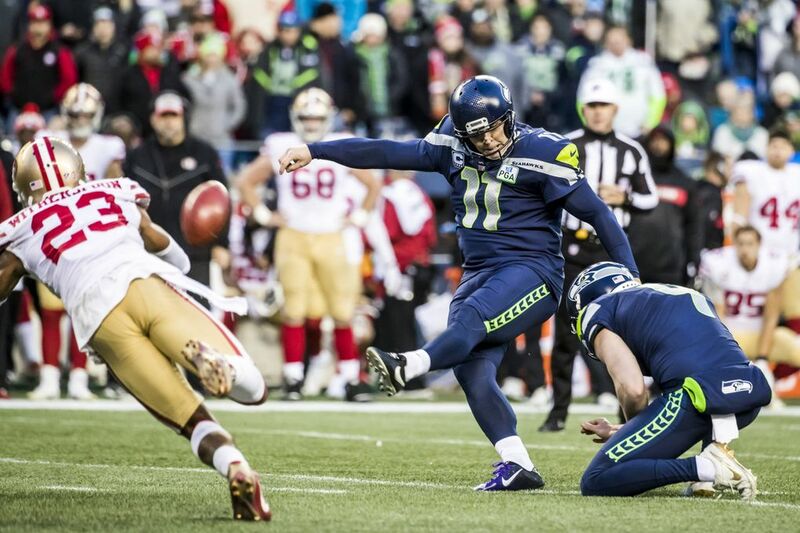 Seattle’s 43 points were the most since the Seahawks’ 46-18 victory at CenturyLink against the Colts last October. 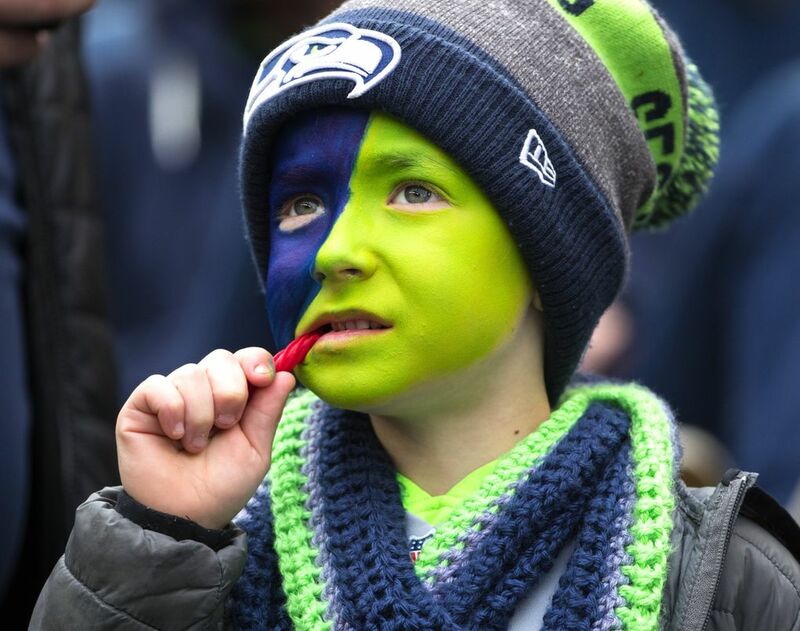 Seattle next is home against Minnesota on Monday Night Football on Dec. 10 in what looms as another game key for the Seahawks’ postseason hopes. 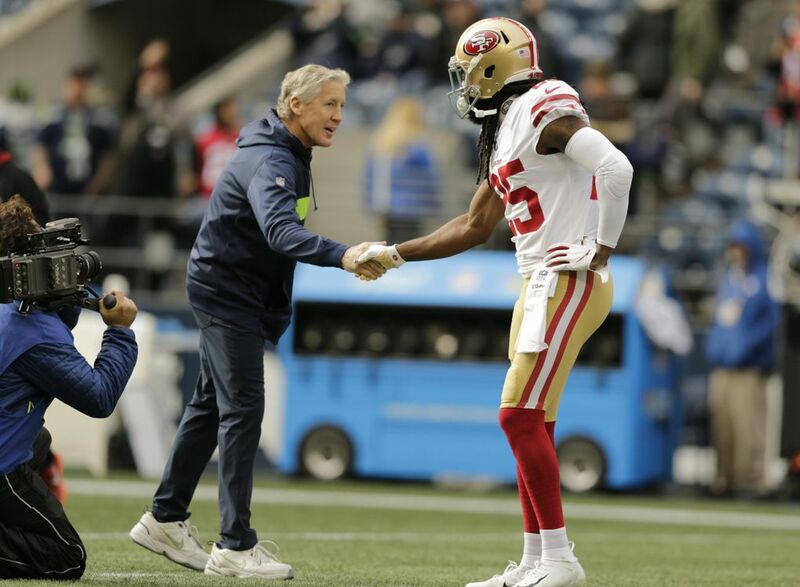 The victory over the 49ers, meanwhile, was Seattle’s ninth in a row in the regular season and 10th straight overall against the team that was once their most-hated rival — a streak that began with the NFC title game and Sherman’s tip. 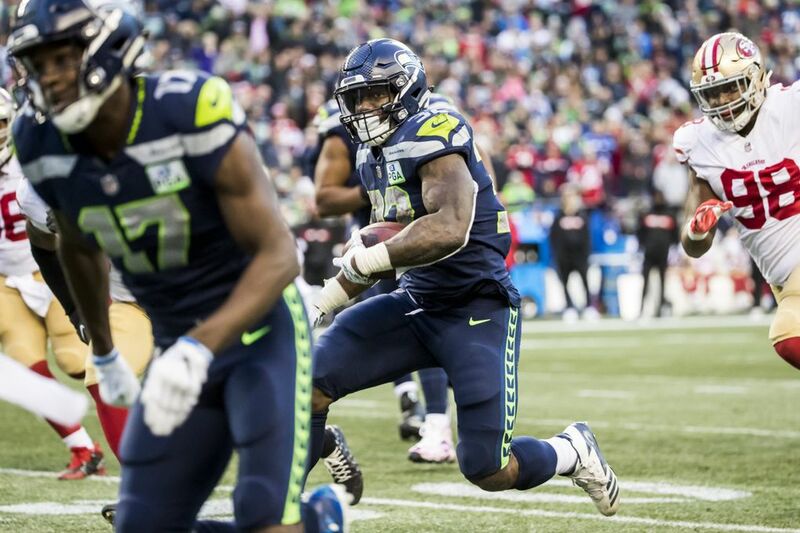 “Feeling good,’’ Carroll said noting Seattle’s offensive efficiency in rushing for 168 yards while throwing for four touchdowns without committing a turnover. 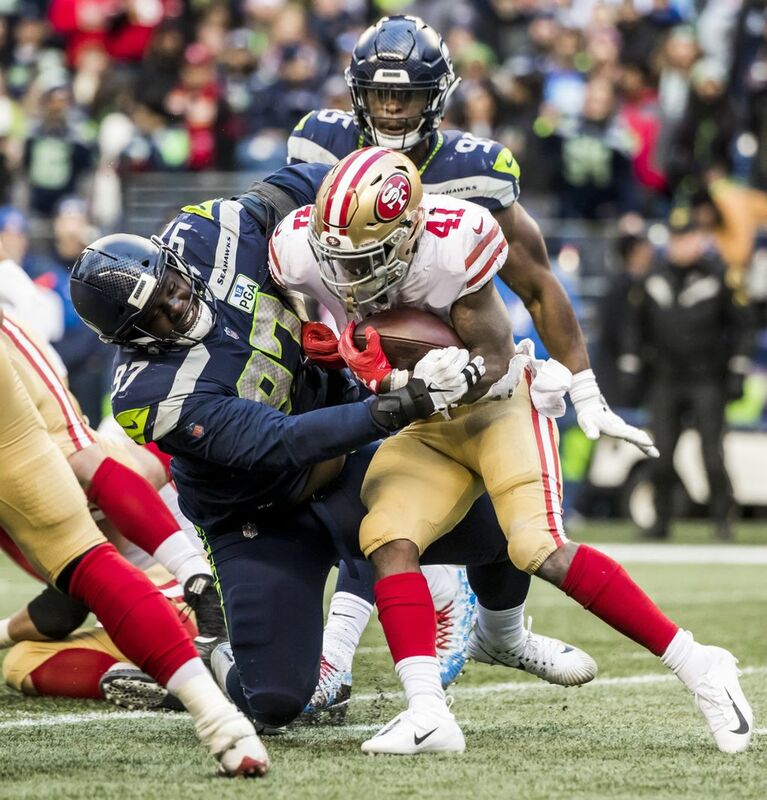 Meanwhile, the defense forced two turnovers in what was the first of a stretch of four out of five games at home to finish the season.